Episode 3: Are you ready for the total eclipse of the sun? A total solar eclipse will take place Aug. 21, and it will be visible in a 60-mile-wide band across the United States, from Oregon to South Carolina. 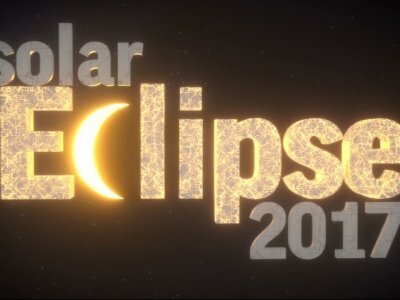 In this episode of “Get Outta Here,” hosted by AP Travel Editor Beth Harpaz, Associated Press science writer Marcia Dunn tells us everything we need to know about destinations, events, eye protection and more to experience “totality,” as that darkness-in-daylight phenomenon is called. Authorities say two women watching the eclipse while standing on a sidewalk in Kentucky were struck by a car, and one has died. State Police Trooper Jody Sims says the car crossed the center line and hit a utility pole and the pedestrians Monday in Hyden, about 120 miles (190 kilometers) southeast of Lexington. NASHVILLE, Tennessee (AP) — The giraffes ran in circles. The flamingos huddled together. And the rhinos just looked confused. At the Nashville Zoo, visitors watched and recorded how the animals behaved when the sky turned dark during Monday's total solar eclipse. And there was plenty to see when the moon slipped in front of the sun. WASHINGTON (AP) — It's not just the skies that get dark when there's a total solar eclipse. So do we. Modern science explains that the sun disappears because the moon is passing in front of it. But before that, people had to come up with reasons for what was happening in the sky. Some of them weren't exactly bedtime stories. FLAGSTAFF, Ariz. (AP) — While much of the country gawks at the solar eclipse, Bobbieann Baldwin will be inside with her children, shades drawn. CAPE CANAVERAL, Fla. (AP) — Total solar eclipses occur every year or two or three, often in the middle of nowhere like the South Pacific or Antarctic. What makes Monday's eclipse so special is that it will cut diagonally across the entire United States. WASHINGTON (AP) — While Monday's total solar eclipse in the U.S. will be a once-in-a-lifetime sky show for millions, there's a small group of people who have experienced it all before and they can't get enough of it. Glenn Schneider has seen 33. Fred Espenak has watched 28. Donald Liebenberg has logged 26. For newbie Kate Russo, it's 10 and counting. NEW YORK (AP) — Prominent astrophysicist Neil deGrasse Tyson has a suggestion for anyone with a view of next week's solar eclipse: Put down your smartphone and take in the phenomenon yourself. Tyson told an audience at the American Museum of Natural History on Monday: "Experience this one emotionally, psychologically, physically." WASHINGTON (AP) — The sun is about to spill some of its secrets, maybe even reveal a few hidden truths of the cosmos. And you can get in on the act next week if you are in the right place for the best solar eclipse in the U.S. in nearly a century. MADRAS, Ore. (AP) — The last time a total solar eclipse blacked out the sun in Oregon nearly 40 years ago, Gene Brick was working in a timber mill that refused to shut down for the spectacle. The World War II veteran and amateur astronomer was devastated when his friends raved about experiencing a pitch-dark sky in the middle of the day. "Everyone who was outside got to see it, and they enjoyed telling me all about it — and I was hurt by that," said Brick, now 92. "But work is work, you know." ST. LOUIS (AP) — If you plan to livestream next month's solar eclipse from one of the prime viewing spots, here's a thought: Keep your phone in your pocket, put on your paper shades and just enjoy the celestial wonder. The Aug. 21 solar eclipse, when passage of the moon completely blocks out the sun, will be seen first in Oregon and cut diagonally across 14 states to South Carolina. It will be the first total solar eclipse visible coast-to-coast since 1918. BARTLETT, Tenn. (AP) — Millions of eyes will be fixed on the sky when a total solar eclipse crosses the U.S. in August, and it's likely many of them will be safely behind the special glasses churned out by a Tennessee company. CAPE CANAVERAL, Fla. (AP) — This August, the U.S. will experience its first coast-to-coast total solar eclipse in 99 years. Total solar eclipses occur every year or two or three, often in the middle of nowhere like the South Pacific or Antarctic. What makes this one so special — at least for Americans — is that it will cut diagonally across the entire United States. MADRAS, Ore. (AP) — Just before sunrise, there's typically nothing atop Round Butte but the whistle of the wind and a panoramic view of Oregon's second-highest peak glowing pink in the faint light. Get ready for solar eclipse mania. Destinations in the path of the Aug. 21 eclipse, which will be visible in the U.S. along a narrow path from Oregon to South Carolina, are going wild with plans for festivals, concerts and viewing parties . Hotels in Casper, Wyoming, are charging five times their usual rates. Rooms at Idaho's Sun Valley Resort have been booked for years.